When talking about mens topaz rings, most people refer to blue topaz gems. It is therefore not strange that many jewelry buyers have never heard of white topaz. Before we get into our discussion on the MAN75 mens white topaz gemstone ring, here is are some very interesting facts related to white topaz. More than 90% of the rough topaz stone that is mined on our planet is white topaz! And yet, almost 70% of the topaz gems used in the gems and jewelry sector is not white. The fact that not many topaz jewels are made with white topaz that, makes some jewelry and gem buyers adore white topaz. White topaz is obviously as hard and durable as blue topaz, it can be found in eye clean quality in fairly large sizes. Most of the white topaz stones that are mined are treated to become blue, this is what we call blue topaz. Depending on the intensity of the blue color on such topaz, the stones are classified as sky blue (light) topaz, swiss (bright) blue topaz and london (deep) blue topaz. When you want a gold or 925 sterling silver white topaz men's ring, you should request for a pure white stone without any brownish color. It is also a good idea to insist on an eye clean white topaz gem for your ring. Kaisilver handpicks and custom cuts topaz and other gems used in our jewelry production - you are therefore assured of the best white topaz when ordering your ring. The fact that we custom cut the stones inhouse gives you some interesting options, the gem can be cut to the shape and size that you need. Your white topaz men's ring can also have a gem that has a speciality cut - multi faceted checkerboard cut, cabachon cut or even the rarer combination of cabachon and faceted cut. A white topaz mens ring with a gemstone that combines a smooth cabachon cut and a regular faceted cut is indeed interesting and impressive. The bottom part of the gem, has a faceted cut, the top portion is a smooth cut, this is something that few other jewelers can offer. A mens white topaz ring, with a flawless custom cut white topaz gemstone. Shown as a yellow gold white topaz ring for men, this jewel can also be ordered as a 925 silver men's ring with white topaz. We offer all gem options and ring sizes for all our rings. It is true that high gold prices have, caused an increased demand for men's silver rings. 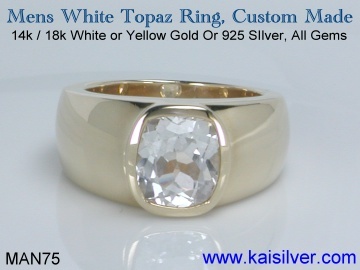 At Kaisilver you can order a gold or sterling silver mens white topaz ring, and rest assured of the quality. This is not merely a statement, we prove our commitment to quality by utilizing the same team of designers, craftsmen, gem experts and quality inspection experts for gold and silver jewelry orders. Most jewelers would give secondary importance to a silver white topaz men's ring, many would not even care to custom make a silver ring for you. 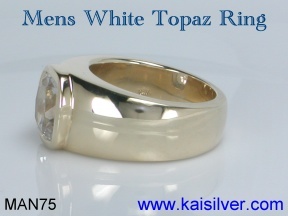 When it comes to a gold white topaz ring for men, you can choose a 14k or 18k mens ring. 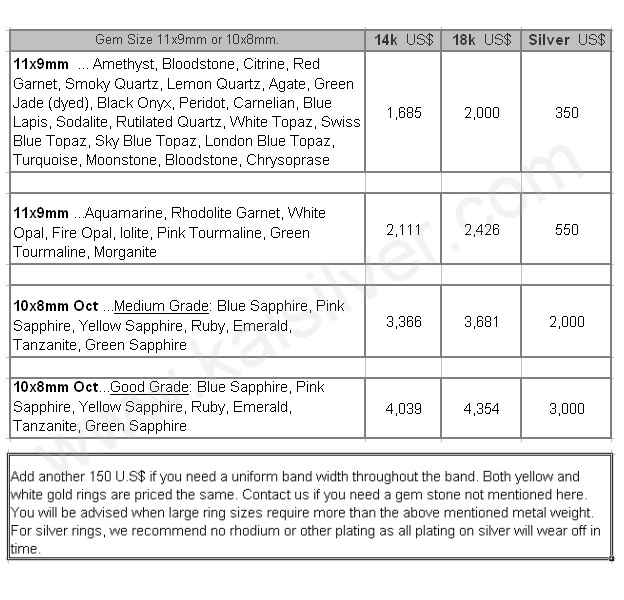 You can request for a yellow or white gold topaz mens ring, both gold color options are priced the same. Our recommendation would be a 14k mens ring, as the hardness of 14k white or yellow gold (over 18k) makes the jewel much stronger and sturdier. A short note about a silver white topaz men's ring. When it comes to silver jewelry or any other silverware for that matter, you should note that the natural phenomenon of tarnish will always occur. It is today fairly easy to polish away the tarnish that might form on your 925 silver white topaz mens ring. Commercially available, silver jewelry polish lotions and even silver polish fabric (cloth pieces) are available. One important thing that needs to be understood about silver rings and tarnish is related to the plating of silver. Many jewelers offer an 'anti-tarnish' option by plating silver with rhodium, gold or even platinum. If you decide to use plating for your mens white topaz gem stone ring, keep on thing in mind. Any type of plating done on silver will wear off after a while, this is true irrespective of who does the plating. The problem is that, the plating wears off in parts and patches, this can leave your mens ring looking quite dull and shabby. If we had to compare the pros and cons of plating, a silver white topaz ring - we would say that it is a better idea to leave the ring unplated. You can also polish off any tarnish that forms on an unplated 925 silver ring. 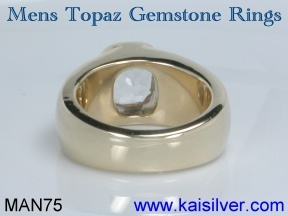 Let us now talk about the type of cutting used for the gemstone in your white topaz mens ring. 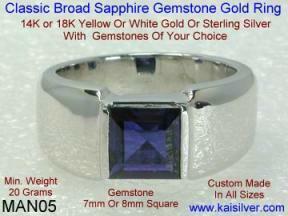 We mentioned above that all Kaisilver gems are custom cut inhouse. To get maximum benefit from this, it is necessary for you to understand the cutting types that you can choose for your 925 silver or gold white topaz mens ring. 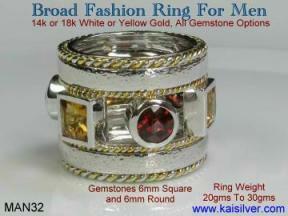 The above image of the Kaisilver MAN75 rings shows a gemstone with a regular faceted cut. You could request for a smooth cabachon cut for the stone in your men's ring too. The multi faceted (checkerboard) cut is also an interesting cutting style for the ring. No matter what cutting style you choose we would suggest that the stone not be kept too high. A protruding gem stone is more likely to hit against hard surfaces and get damaged. A low profile gem mounting is best for rings that are worn frequently or throughout the day. Even a casual jewelry buyer would tell you that this Kai Silver mens white topaz ring is handsome and impressive but, there really is much more to it than meets the eye. Most jewelers conveniently forget about longterm durability, when designing and crafting their jewelry. It is no big secret that, most buyers look only at price and external appearance, when selecting their jewels. The point is that, a flimsy or light weight jewel or even a badly designed jewel can result in bending and deforming of the jewel. Problems like loose gem stones and gems that fall out of the mounting are also possible. All Kaisilver jewelry is based on well researched designs, no compromise is made on durability even if it means, higher price points which in turn result in limited market scope for us. Below are some of the main features incorporated into the MAN75 mens white topaz ring, to build longterm durability into the jewel. You should remember that mens gold rings, will see prices rising as the gold prices increase. Men's rings generally have larger dimensions and need proportionate metal weight to ensure durability. Jewelers have learnt some rather selfish tricks, they manage to produce mens rings with increasingly lower metal weight. At Kai Silver, we are fully aware that good metal weight is at the foundation of a durable jewel, we will not compromise on durability, even if it means a reduced market share. However what we will suggest is that you consider a silver mens white topaz ring if, a gold ring is beyond your budget. Since the quality of design, gemstones and craftsmanship will remain the same for the men's 925 silver or gold white topaz gemstone ring, the silver option does seem attractive. 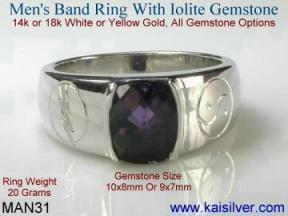 Mens Iolite Band Ring ... details. Mens Fashion Wedding Band ... details. Sapphire Wedding Band ... details.